The findings of the study, published today in the premier international scientific journal Nature Neuroscience, reveal a novel molecular mechanism underlying the beneficial effects of mitophagy, the cellular process of mitochondria recycling, against the pathogenesis of Alzheimer’s disease. 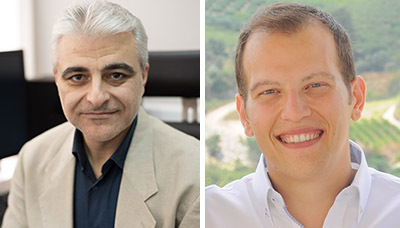 IMBB Researchers, Dr. Konstantinos Palikaras and Dr. Nektarios Tavernarakis (Professor at the Medical School, University of Crete, and Chairman of the Board at FORTH) in collaboration with the team of Prof. Vilhem Bohr at the National Institute on Aging (NIA) of the National Institutes of Health, (NIH) in Baltimore, USA, together with Dr. Evandro Fang at the University of Oslo and the Akershus University Hospital, Lørenskog, Norway, demonstrated that mitophagy is impaired inAlzheimer’s disease and that its pharmacological stimulation reverses the disease’s pathological features, including cognitive deficits. Alzheimer’s diseaseis the most common form of dementia affecting millions of patients worldwide. Although intense research efforts have been focused on the development of novel therapeutic strategies against Alzheimer’s disease, at the moment there is no effective treatment. Mitochondrial impairment is a major hallmark of Alzheimer’sdisease pathophysiology.Mitochondria are indispensable and highly dynamic, energy-generating organelles in all eukaryotic cells that also play pivotal roles in fundamental cellular processes. Alterations in mitochondrial homeostasis heavily impact cellular metabolism, and critically influence organismal physiology. Neuronal cells are critically dependent, perhaps more than any other cell type, on proper mitochondrial function. Thus, maintenance of neuronal homeostasis necessitates a tight regulation of mitochondrial quality control. A wide range of complex and highly specialized molecular and cellular pathways have evolved to preserve mitochondrial homeostasis. Mitophagy is a selective type of autophagy mediating the elimination of dysfunctional mitochondria, and is the major mechanism, by which cells adjust their mitochondrial content in response to stress of metabolic state. Using a cross-species multifaceted approach involving both human patient samples and cells, the mouse (Mus musculus) and the simple nematode Caenorhabditis elegans the research teams of Prof. Tavernarakis, Dr. Fang and Prof. Bohr now show that defective mitophagy has a pivotal role in the development and progression of Alzheimer’s disease. 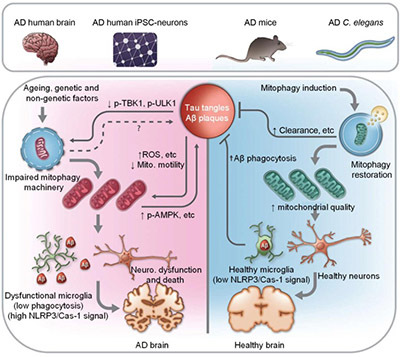 Accumulation of dysfunctional mitochondria has been detected, post-mortem, in brains of Alzheimer’s disease patients, as well as in mouse and nematode transgenic models of the disease. Interestingly, pharmacological upregulation of mitochondrial clearance ameliorates several pathological features of Alzheimer’s disease. Importantly, mitophagy induction reverses cognitive impairment both in transgenic nematodes and mice. These findings identify defective removal of damaged mitochondria as a critical contributor in Alzheimer’s disease pathogenesis and highlight modulation of mitophagy as a potential therapeutic intervention strategy. The evolutionary conservation of the regulatory factors involved in the elimination of defective mitochondria underscores the pivotal role of mitophagy across species. Identifying specific mitophagy modulators may lead to the development of effective therapeutic intervention strategies tackling mitochondrial-associated pathologies and provide critical insights with broad relevance to human health and quality of life.